I love the color contrast in this bright 20 x 63" scarf. The background is fairly equal in its use of white. black and shades of grey. The punch of color comes from what look like paint brush strokes in beautiful reddish purple. This corded necklace is made using satinique cording. The length can vary from about 17 to 20 inches with a center jeweled piece that adds 2.5 inches. 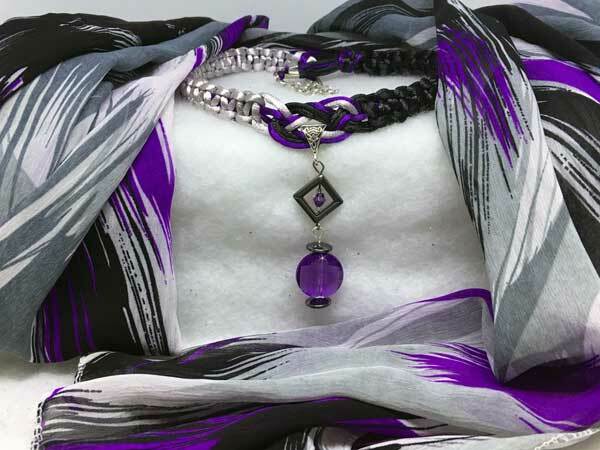 It is done in a silvery grey, black and the same shade of purple as is in the scarf. The jeweled piece starts with an open hemalyke diamond with a purple crystal bicone in the center. Hanging from that is a fully-faceted purple glass coin, surrounded by hematite discs. The piece is finished with a lobster claw clasp and added chain for more versatility with the length.